Dr. Koenig joined the Mechanical Engineering Department in 1967. He previously held positions at Hazeltine Electronics, Radio Corporation of America, and General Electric. He has consulted on a regular basis for United Technologies Research Center and Pratt & Whitney. During the period 1971-1992, Dr. Koenig was engaged with UConn’s School of Medicine in the numerical evaluation of biomechanical applications, such as orthodontics, tooth movement and orthopaedics and was co-investigator on various NIH grants. His journal contributions in the area of orthodontic appliance design and evaluation became the standards by which these devices were designed and manufactured. While on sabbatical leave at the Technical Hojskole in Lyngby, Denmark, Dr. Koenig conducted research and gave seminars in material modeling and finite element applications. 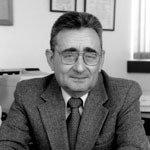 Dr. Koenig is the author of Modern Computational Methods, published in 1998 by Taylor & Francis, an introduction to computational mechanics, proceeding from basic computational tools to advanced computational procedures and applications.